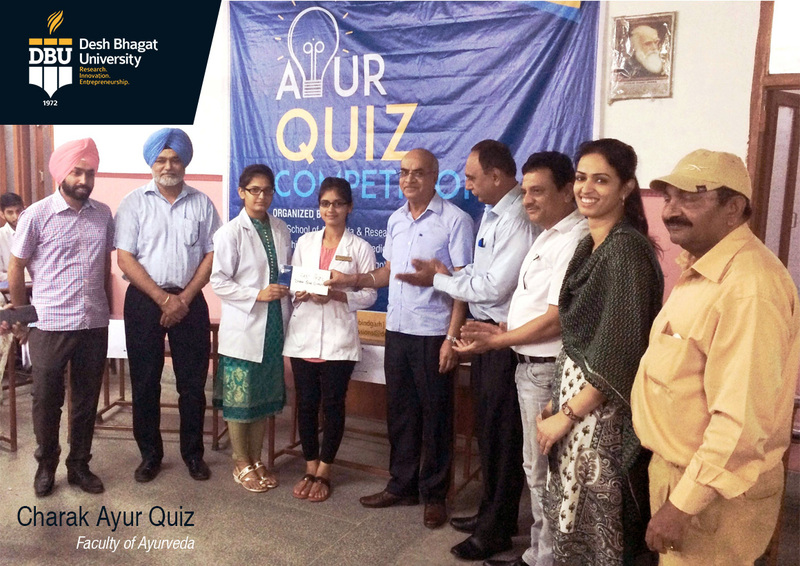 Quiz is one of the easiest and most interesting methods to enhance knowledge and to sharpen brain skills. It also helps the students to learn and understand some complicated issues in a simple way, said Desh Bhagat University Vice-Chancellor Dr. Virinder Singh. He was presiding over the prize distribution event of Quiz Competition held at Faculty of pg school of ayurveda. He awarded an amount of Rs. 1100 to the first prize winner team and Rs. 500 to the runner up team along with certificates. 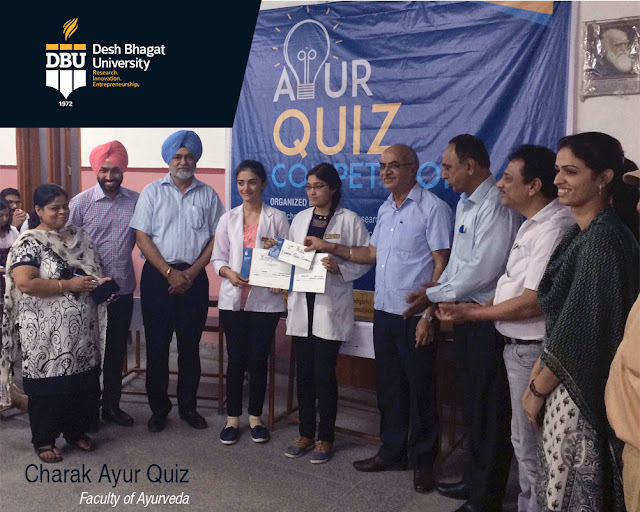 While giving details, Director Dr. Kulbhushan said that the Charak Ayur Quiz was organized to acquaint the students with the important topics of ayurveda and research. Students of different ayurveda courses participated in it and showed their skills. The competition was divided into two categories, individual and team zone. After different rounds of the quiz, six teams of the students entered in the finals. The final was bit tough but was highly interesting, as the brain teasing and buzzer round brought the teams very close to each other at Score board. Finally, the team consisted of Isha and Kirandeep Kaur took the lead by scoring 95 points and they were declared the winners. The team which got second position with 90 points consisted of Shabnam and Anudeepa. The students who performed well under different categories were also awarded the certificates of merit. Their names are Sakshi , Shubham, Ruchi, Damandeep Kaur, Ankush, Gurbaj singh, Harsha and Sargam. Chancellor Dr. Zora Singh and Pro Chancellor Dr. Tajinder Kaur appreciated the initiative taken by Faculty of Ayurveda.DBU, top ranked university in Punjab has been the pioneer of Ayurvedic Studies in Punjab. The pg school of ayurveda in punjab is renowned for notch academics and offering the best ayurveda courses in India in specialized fields of Ayurveda like Kayachikitsa, Rasa-Shastra, Ayurvedic Medicine and Surgery, Panchkarma, Naturopathy and Yogic Sciences.